Our programs are designed to deliver the best organic care possible, use environmentally friendly materials to treat insect and disease pests, while boosting the health of the plants. A healthy plant is much less susceptible to attack from landscape pests... so in order to reduce pest treatments, we need to reduce plant stress. We utilize OMRI (Organic Materials Review Institute) listed products to control pests on our plant health care programs. This allows us to use the greenest of pest treatment materials so they do not undo all the great soil health-building that we do. Yes, all plants have to pay taxes to Mother Nature! These taxes are foods for beneficial soil life that the plants release into the soil from their roots. In some cases, plants put almost half of their energy into feeding the soil life. That’s a lot of taxes when it’s a 100 foot tall tree! When plants are stressed out in the landscape (or damaged in a forest) they can’t make as much food through photosynthesis and thus they can’t pay their taxes. This is when Mother Nature sends in the tax collectors: insects and diseases. 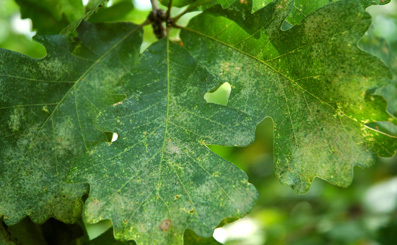 Lace Bug damage on an Oak tree. Managing your soil correctly can reduce conditions that favor landscape pests. Pests in general are opportunistic. A pest that is prevalent in a forest will attack a tree regardless of how healthy the tree is. A good example is Gypsy Moth Caterpillars or Hemlock Wooly Adelgid. A pest that is prevalent in the landscape, but not in the forest, typically seeks out a stressed plant to attack. Bronze Birch Borer is a good example of a landscape pest. Plants in the landscape get stressed out because they do not have the natural biological associates that would keep them healthy in a forest ecosystem. Landscape sites are typically very disturbed. Organic matter is usually inadequate and the beneficial soil microbes are lower than needed and out of balance. This allows the landscape pest to get an easy meal. These insects and diseases are the messengers that Mother Nature sends us to let us know the environment needs help. So when we see pests in your landscape, we don’t just shoot the messenger… we work to get your soil in balance and ready to grow healthy plants. Our methods are based on what has kept plants healthy for millions of years — soil microbiology. There are billions of beneficial microbes in just a teaspoon full of healthy soil. These microbes perform many functions that protect the environment and keep plants healthy. 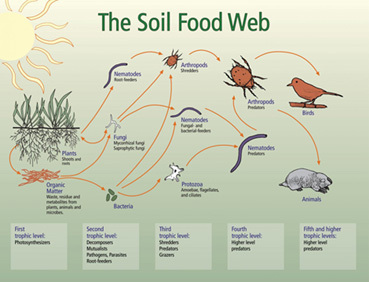 Healthy soil food cycle diagram. The microbiology retains plant nutrients so they don’t leach into our drinking water and oceans. This allows organic land-care managers to use much less fertilizer. As your plant roots interact with the life in the soil, soil nutrients are cycled to the plants as needed. 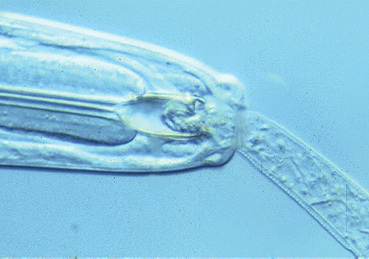 Predatory nematode feeding on a plant-parasitic nematode. Beneficial bacteria and fungi create soil aggregates and pores in the soil. This works to alleviate compressed/compacted soil and allows water to be held in the soil longer for your plants. Less irrigation is needed so we can conserve water. Once the soil structure opens up on the microscopic level, the soil becomes much more habitable to larger soil life like earthworms. This is when your landscape can take a quantum leap to being healthy and sustainable.